Do you know a senior citizen that’s having trouble getting into a bus or SUV? Finding a safe step stool for your aging adult or physically challenged loved one can be difficult. Many of us have parents, grandparents or aunts & uncles that are either aging or physically challenged and have problems getting into a bus or SUV. Possibly, they have just had surgery, making it almost impossible for them to lift their leg more than 5 or 6 inches off the ground. This really poses a serious risk of injury when you try to take them out to grab a meal or go to a doctor’s appointment. Getting your loved one into your vehicle or doing anything that requires transporting them can be a real hassle. Independent retirement homes and other adult communities have the exact same problem and they have tried to solve the problem by building their own wooden step stools out of plywood. Other communities have tried to use old Coca-Cola bottle crates as wooden step stools to help their residents overcome this problem. Some have even resorted to using a heavy block of wood as a wooden step stool so their senior passengers could get up to that first step on the bus they were traveling on. 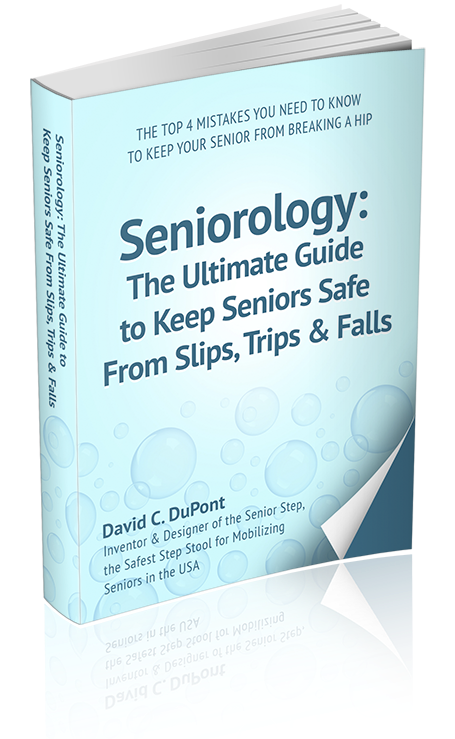 Directors for adult living facilities as well as the directors of nursing for these facilities are faced with finding a safe step stool for their seniors that is light, durable and easy to see. Finding a safe step stool to solve this national problem shouldn’t have to be this hard! Hasn’t anyone come up with a 6 inch step stool for seniors to solve this problem? Look no more!! There is one safe step stool designed with the senior citizen specifically in mind. This step stool is called the Senior Step stool and it’s made by a company called Shure-Step®. You can find the Senior Step stool at www.Shure-Step.com. This safe step stool is 6 inches high, it has a large top surface area, it has a rough sandpaper pad on the top so your seniors’ feet will not slide or slip while stepping on it and the color is bright yellow so it’s easy to see. If you’re need includes using a safe step stool in very cold climates where there is ice on the ground, the Shure-Step® company offers ice cleats for its step stools. The Senior Citizen population in the US is growing quickly. This segment of our population has special needs regarding mobility. In order for this segment of our population to be mobile they require the assistance of a safe step stool. Most step stools are not user friendly for physically challenged older adults, but the Senior Step is. In fact this safe step stool was designed with information from 3 different directors of adult living communities and one director of nursing. If your looking for a safe step stool to help an older adult get into a bus or SUV, be sure to go to www.Shure-Step.com. What type of step stool would you suggest for someone who weighs at least 320 lbs?